There are some really lovely pears and apples in abundance right now. The pears I bought were especially succulent to eat as is, but since it’s been raining and overcast for several days over the last week, it’s time to conjure up a simple and comforting winter harvest dessert to shake the cold! This Winter Fruit Crisp is a version made mostly of ingredients out of our good old-fashioned American pantry. To start, I use apples and pears tossed with lemon juice. Since I love tart things, I added a handful of dried cranberries. But for a spot of intrigue, I decided to throw in a few chopped dates, which are cooked for a couple of minutes with brown sugar, the spicy warmth of cinnamon and cardamom, a splash of Amontillado sherry, a perk of orange zest and finished with a dab of butter, all of which conspire to create a very lovely spicy caramel. For textural contrast, the streusel topping includes some oatmeal and walnuts. The proportion and blending of these flavors and textures really plays out beautifully. Each bite has layers of luscious fruit, heady spice and soft, chewy, crunchy texture. The aromas and flavors that emanate from each spoon are very much in keeping with the season. It’s rustic and familiar but in a very different and delicious way, a quintessentially winter treat so good you could certainly offer it to your best friend. Or anybody you’d like to be your best friend. 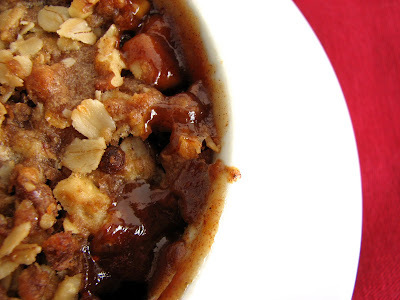 As the rain beats on our windows, light the fireplace and curl up with this Winter Fruit Crisp for a kind and soothing song of warmth and comfort. - Pears should be ripe but firm. I used D’anjou pears and Fuji apples. - I used a Lustau Amontillado Los Arcos Sherry, which has a roasted nut bouquet and a trace of caramel. 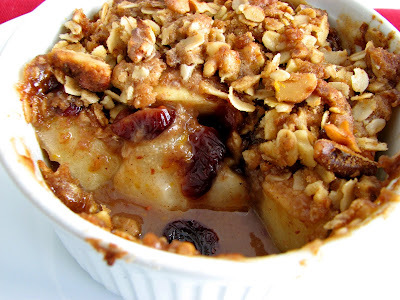 - You could certainly omit the walnuts in the streusel, but they really do add a great earthy/toasty goodness. 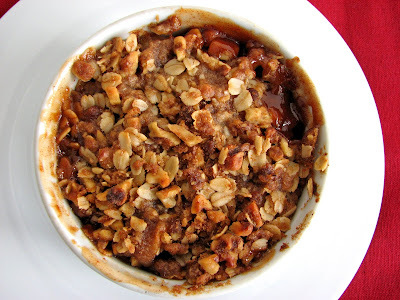 To make the topping, whisk together the flour, brown sugar, salt, oatmeal, cinnamon, orange zest and chopped walnuts. Place the butter in the mixture and work it in with your fingers until the mixture is combined into large crumbles. Set aside. Peel, core and cut the apples and pears into medium-sized chunks. Place the fruit in a bowl and toss with the lemon juice, granulated sugar and flour. Place sherry, water, brown sugar, orange zest, spices and salt in a saucepan over low heat. Bring to a boil for about 2 or 3 minutes, stirring. Add the chopped dates and dried cranberries and lower heat. Cook for another minute or two to blend flavors. Cool for a couple of minutes, then gently toss together with the apples and pears until all ingredients are combined. Divide the fruit into 6 ramekins or pour into a baking dish. Sprinkle the topping evenly over the fruit and out to the edges of the dish so the fruit is completely covered. Place the baking dish on a sheet pan and bake for about 30 minutes, until the topping is browned and the fruit is bubbling vigorously. Serve warm. 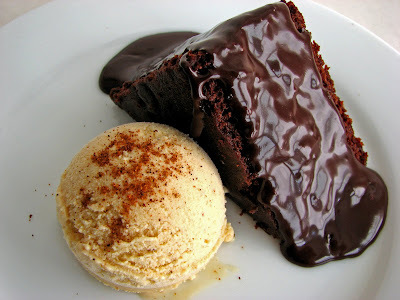 The use of spicy chile powders in desserts is nothing new. 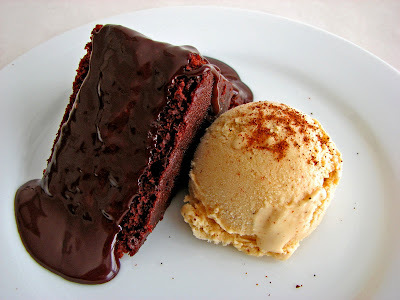 There are all kinds of delicious cakes, cookies, truffles and ice cream that incorporate the kick of chile. Most of the time they include chocolate, but I thought I’d work on spicing up a vanilla ice cream because I wanted to see if I could get a true chile flavor that would be enhanced by a chocolate component. Since I love the taste of chile, I wanted to be able to distinguish the chile flavor on its own. This recipe is inspired by all those tasty adventures. 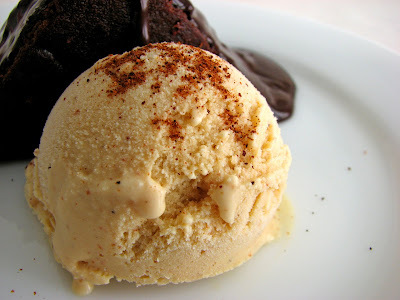 I start with a simple vanilla ice cream that contains a dusting of ancho and chipotle chile powders. It’s an intriguing combo that introduces a really wonderful smokiness with a little kick of heat in a creamy base. And when it cozies up to the chocolate, the full effect is remarkable. This is a very adventurous way to enjoy a nearly seamless blend of all the amazing sensations of spice, heat, deep dark cocoa and vanilla. It’s been one of my favorite recent experiments. - I used 1 teaspoon of ancho chile powder and 1/2 teaspoon of chipotle chile powder. I think it’s the right level of heat and I love the luscious and complex smokiness that the chipotle brings to the combination. But every palate is different, so add a bit of the chile powders at a time and see what you think. It’s going to increase in intensity as it sits in the base overnight but the flavor of the ice cream also mellows out nicely over time in the freezer. 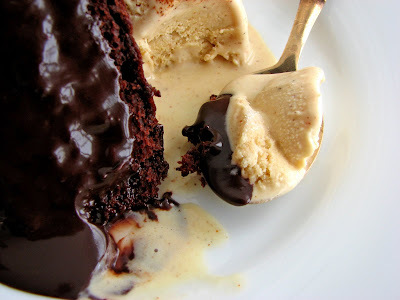 - If you don’t want to make the cake, try the ice cream with the Chocolate Sauce. - I can also imagine this ice cream with a light caramel drizzle. - The high ratio of sugar to butter in the cake recipe requires you to cream the mixture for about 6 to 7 minutes until it is light in color and fluffy in texture. At first you’ll wonder how it’s going to come together but it will. Honest! - I added 1/4 teaspoon of cinnamon to the cake recipe in keeping with the theme. Combine the milk, sugar and salt in a medium saucepan. Heat slowly over low heat, until the sugar is dissolved and the milk is steaming a bit, stirring to fully combine. Whisk the yolks in another bowl. Take off the heat and add some of the hot liquid into the egg yolks. Whisk constantly to combine and temper the two elements. Add the remaining milk and whisk thoroughly. Return to the saucepan and cook on low heat, stirring constantly with a wooden spoon or heatproof rubber spatula until it begins to thicken and coats the back of a spoon, leaving a clean trace. Remove from heat and strain into the cold heavy cream, whisking to mix and cool. Add the vanilla extract and the chile powders, tasting as you go. Cover and chill thoroughly, preferably overnight. Freeze in your ice cream maker. Pour into a clean airtight container, press a piece of plastic into the surface, cover and place in the freezer to firm up. Preheat your oven to 350 degrees. Prepare an 8” cake pan with butter, parchment and a very light dusting of flour. Sift together flour, baking soda, salt and cinnamon. Whisk cocoa and water together until thoroughly blended. Combine buttermilk, vanilla and water. Cream butter and slowly add sugars. Cream mixture until light and fluffy, about 6 to 7 minutes on a stand mixer. Stop and scrape down the bowl at regular intervals. Add egg and blend well. Scrape down the bowl. Add cocoa mixture and combine thoroughly. Gently add dry ingredients in 3 additions, alternating with buttermilk, beginning and ending with the dry ingredients. Stop mixing just before it is fully blended and finish by folding gently with a rubber spatula until there are no streaks. Be careful not to over mix. Pour into prepared pan and smooth batter evenly. Bake @ 350 for 20 to 25 minutes or until a toothpick tests with a few moist crumbs adhering. Cool 10 minutes. 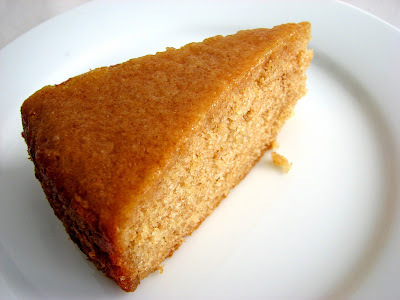 Run a thin bladed knife around the edges to loosen and turn out the cake. Cool completely. Bring water and sugar to a boil to dissolve. Add cocoa and salt and bring to a boil. Reduce heat to medium and boil for about 3 minutes, whisking constantly to prevent scorching. Once it has thickened, remove from heat and add vanilla and cream. Add salt to taste. Cool. It’s back to basics. Although I’ve been reading various predictions about the latest food trends for the coming year, lately I’ve been more in the mood to keep things pretty basic. 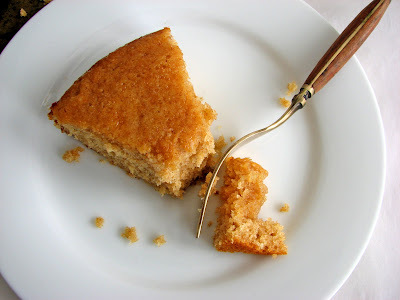 It’s been great to see a resurgence of wholesome ingredients over the last decade and I think as we begin a new one, it would be especially nice to start off with a rather simple but extraordinary Whole Wheat Cake. And in keeping with the theme, I’ve sweetened it with honey. Nothing could be more simply satisfying. Whole wheat pastries of the past have often suffered from being too dense or dry, but I think recipe development using whole wheat flours has improved dramatically. 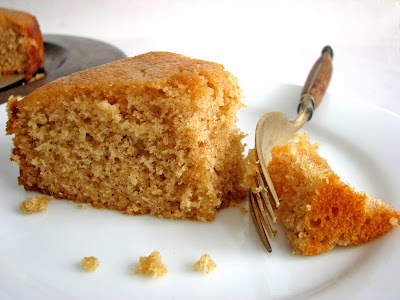 For this cake, I use King Arthur Traditional Whole Wheat Flour for its superb flavor and easy availability. It’s milled from the hard red spring wheat of the northern Great Plains and uses 100% of the wheat berry, which provides the full flavor and nutrients of the bran and germ. I think it’s the best of its kind out there and I highly recommend it. I also use honey to sweeten the cake. There are over 300 types of honey produced in the United States and it’s a great pleasure to explore so many distinctive varieties. One of my favorite indulgences is sourwood honey, which is widely regarded as the queen bee of honey. Tupelo, lavender, sage and eucalyptus are also favorites. Use your own favorite in this recipe. If you’re in the mood to return back to the basics, I think you’ll find this pastry a beautiful reminder of the delicious goodness of quality whole wheat flour. - I think this cake is very nice on its own. Once you try it, you’ll find it could also serve as a great basic palette for other natural complements. I think it would be really delicious with a fresh blackberry coulis or fresh fig compote in spring and summer or sautéed apples or pears or bananas in winter. You can top with sliced almonds for extra texture or add a pinch of spice to the batter. But do try it plain to see how it strikes you. - The ground wheat germ in whole wheat flour contains oil that can become rancid over a long period of time. Whole wheat flour will keep 1 to 3 months at room temperature. For longer storage, place it in an airtight container or freezer bag in your refrigerator. It will maintain good quality for about 6 months in the refrigerator and up to 12 months in the freezer. If you place it in the freezer, be sure to bring it to room temperature before using it. The very cold temperature of frozen flour will discourage the baking properties of yeast or baking powder. Preheat oven to 350 degrees. Grease and flour an 8” x 2 ” cake pan. Sift flours, baking powder and salt together. Cream butter and sugar until thoroughly combined. Add honey and beat until light and fluffy, about 4 minutes, scraping down the sides of the bowl as needed. Add vanilla and blend. Beat in eggs one at a time, mixing thoroughly after each addition. Add a third of the flour mixture alternately with the buttermilk, beginning and ending with the flour. Scrape down the bowl to be sure everything is incorporated. Do not overmix. Pour into prepared pan and spread into an even surface with a spatula. Bake for about 35-37 minutes until a toothpick tests clean. 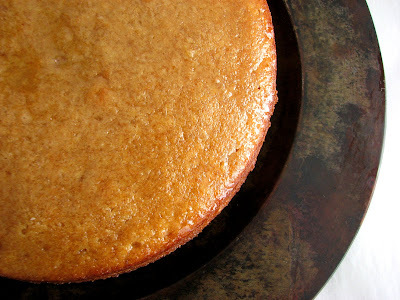 Run a thin knife around the edge of the pan to loosen cake. Cool in the pan on a wire rack for about 10 minutes. Invert cake, turn right side up and place on the rack until completely cool. Place the honey, water and salt in a saucepan and warm over low heat until dissolved and blended. Whisk in the butter. Remove from heat and whisk in the confectioner’s sugar. Add lemon juice to taste. Place cake on platter and top with the glaze. The beginning of a new year always brings along with it some time to reflect on all the possibilities that lie ahead. If you find yourself sitting at your kitchen table gazing out the window and ruminating over last year’s accomplishments and this year’s opportunities, you just might enjoy some company. 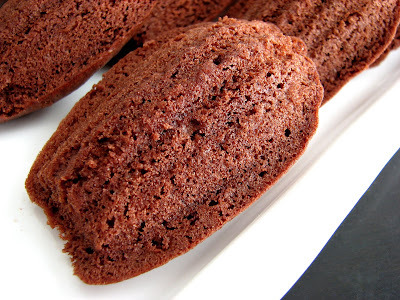 I highly recommend a Chocolate Olive Oil Madeleine to go along with your reverie. Not exactly Proustian, but every bit as delicious and enjoyable and thought-provoking. The marriage of dark chocolate, extra virgin olive oil and salt is a miraculous one. Somehow these three ingredients have managed a rendezvous that can only be described as a thing of unique beauty. The complex earthy richness of cocoa blended with the rich bright lusciousness of extra virgin olive oil is only brought to a higher level with a generous pinch of salt. To make the best of it, I chose to highlight these ingredients in a simple recipe for madeleines to keep the flavors pure and easy without a lot of extra frill. The recipe can be assembled in just a few minutes. If you love the sprightly tango of chocolate and fruity olive oil, these petite cakes will brighten your step. Here's to great memories! - I used California Olive Ranch Arbosana Extra Virgin Olive Oil for this recipe and it is perfect. It’s refined yet assertive enough to complement the cocoa. The results are really delicious. 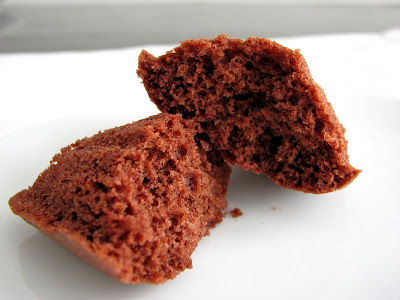 - These bake pretty fast, so keep your eye on them. Mine baked in 11 minutes. The cakes should spring back when lightly tapped. - Salt is very important in chocolate recipes. It really enhances the flavor considerably. I used 1/8 teaspoon of salt in the mixing and then added about half as much again when I tasted the batter. So I recommend that you slowly keep adding salt to taste once you have the batter blended. 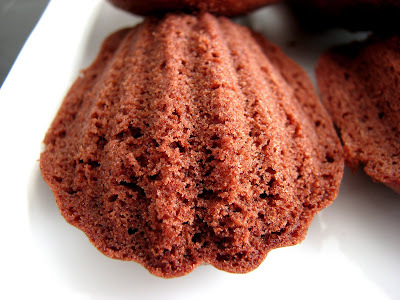 - Madeleines are meant to be eaten the same day. Preheat the oven to 375 degrees. Generously grease a madeleine pan. Sift the flour, cocoa powder, salt and baking powder. Beat the eggs until thoroughly blended. Slowly add the sugar and continue beating until the mixture is thick and pale, about 3 minutes. Add vanilla. Using a rubber spatula, gently fold in the flour mixture until just combined. Fold in olive oil. Taste for additional salt. Scoop into madeleine pan and bake for 10 to 12 minutes. 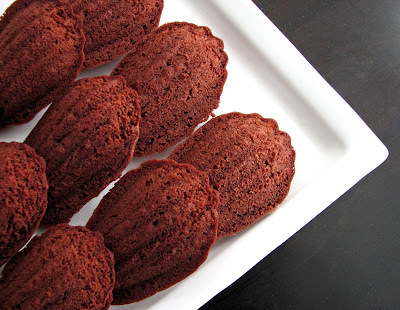 Cool the pan for a few minutes and then flip out the madeleines. OK, it’s time for some color and spark! And along with that, a good measure of tartness along with the sweet. Sometimes I get an ingredient in my head and I just have to do something with it. This is one of those times when I really couldn't resist the goodness of tangerines. Winter is the best time for gorgeous citrus fruit and tangerines in particular are delicious and juicy and plentiful right now. This bright sherbet brings the best of the season forward in a tantalizing mix of cool and tangy refreshment. To my amazing family, wonderful friends, incredible blog buddies and all my fabulous readers, thank you so much for such a grand year full of inspiration and prosperity. It's been a great pleasure discovering all your beautiful blogs. Here's to another very exciting year full of optimism, hope, love and lots and lots of delicious little morsels. Happy New Year! - If you don’t have access to tangerines, substitute fresh orange juice. 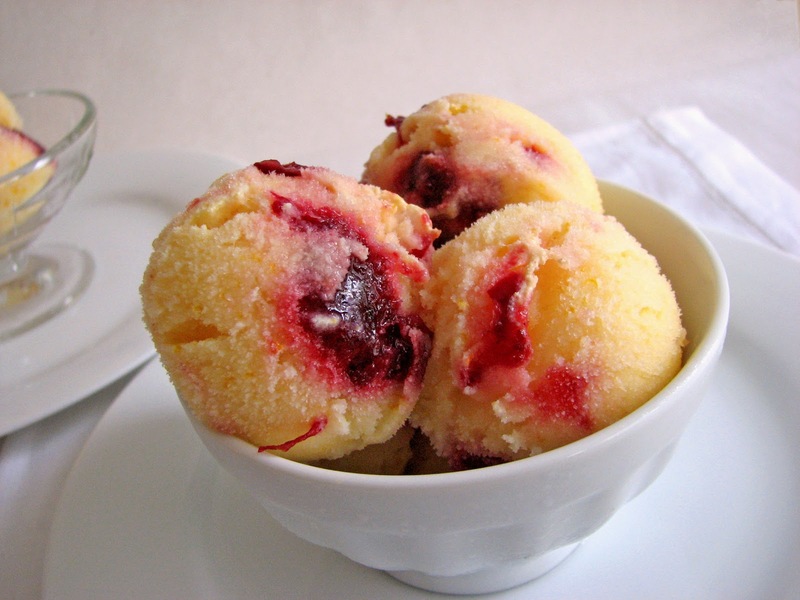 - Sorbets and sherbets take a bit longer to churn in your ice cream machine. I churned this for about 20 minutes. It will still be soft and slushy but will firm up in your freezer. 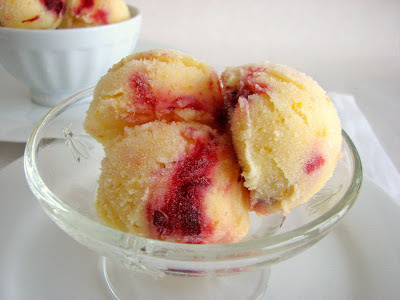 - To preserve the bright color contrast, it’s best to layer the sherbet with the cranberry mixture. If you try to fold it in, the sherbet will turn a bright pink. 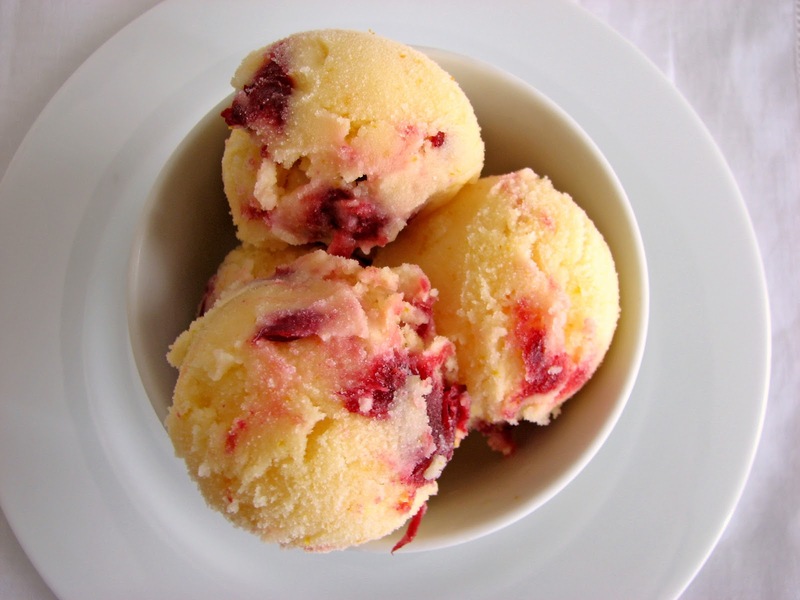 - Although you may be tempted, lowering the sugar in either component will result in an icy sherbet and icy cranberries. The lemon juice helps to balance the sweetness. - I’ve also tried brown sugar in the cranberry compote for a more distinct flavor. To make the sherbet, combine the sugar and orange zest in a food processor and pulse until the sugar is aromatic and moist. Add the tangerine juice, lemon juice and salt and process until sugar is dissolved. Pour into a clean container. Whisk in the milk and vanilla. Cover and place in the refrigerator until thoroughly chilled. Place all the ingredients for the Cranberry Compote in a saucepan and stir over medium low heat for about 10 minutes until the cranberries have softened and the mixture is thickened. Pour into a clean container, cover and place in the refrigerator to chill. The compote will thicken more as it cools. Freeze the sherbet according to your machine’s instructions. It will be soft and slushy but will firm up in the freezer. Pour about a third of the sherbet into a clean container. Dot the surface with the cranberry mixture. Pour another third of the sherbet on top. Add another layer of cranberries and then finish with the last of the sherbet. Press a piece of plastic wrap onto the surface, cover and place in your freezer until firm.